On Saturday May the 2nd, Dolomiti Contemporanee will host a day dedicated to culture and contemporary art. A talk, open to the public, is going to take place at the Nuovo Spazio di Casso, from 2 to 6 PM. 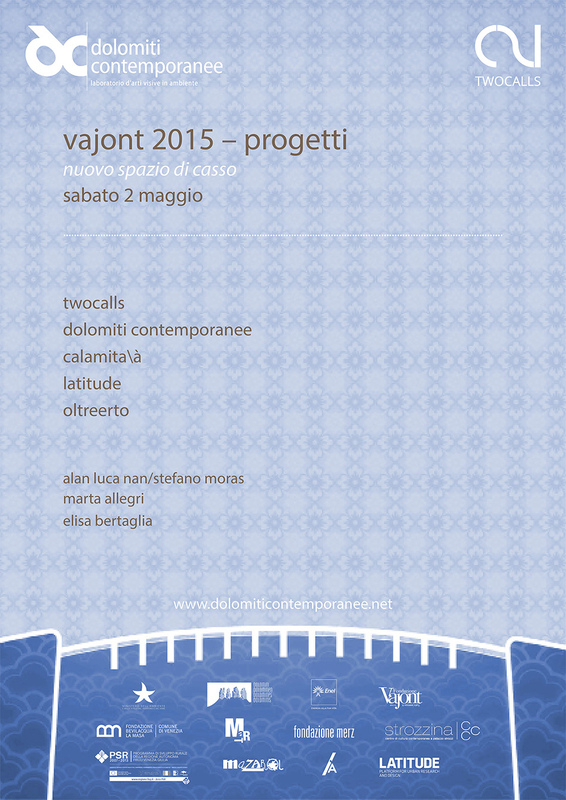 Its title: Vajont 2015: territory, history, value of the cultural projects. Interaction practices, survey methods, processes and perspectives. In the first section of the talk, the International Artistic Contest Two Calls for Vajont will be presented. It was launched by Dolomiti Contemporanee in June 2014, and its realization was made possible by the collaboration with Enel and the patronage of numerous public administrations and authorities of the Friuli Venezia Giulia and Veneto regions, not to mention by the various relevant cultural partners (Mart Rovereto, Merz Foundation of Turin, CCC Strozzina Florence, Institut Francais, Pianoproject, Bevilacqua La Masa Foundation). Some members of the Contest’s Jury will take part in the event, as well as some of the artists who have participated, who will briefly present their project. We would like to remind that the talk will take place only two days after the closing of the first phase of Twocalls (April the 30th), and that the winners will be declared by the end of May. For the occasion, a selection of the projects in the final will be displayed at the Spazio di Casso during these days: 3rd, 9th, 10th and 17th of May (from 1o AM to 12:30 PM and 2:30 PM to 7 PM). Sabato 2 maggio, Dolomiti Contemporanee organizza una giornata dedicata alla cultura e all’arte contemporanea. Dalle ore 14.00 alle ore 18.00, presso il Nuovo Spazio di Casso, si svolgerà un talk aperto al pubblico, dal titolo Vajont 2015: il territorio, la storia, il valore dei progetti culturali. Pratiche d’interazione, metodologie d’indagine, processi e prospettive. Interverranno alcuni dei membri della Giuria del Concorso, ed alcuni degli artisti che vi hanno partecipato, i quali presenteranno brevemente il proprio progetto. Ricordiamo che il talk si svolge a due soli giorni dalla conclusione della prima fase di Twocalls (30 aprile), e che la determinazione dei vincitori avverrà entro la fine dello stesso mese di maggio. Nell’occasione, verrà presentata presso lo Spazio espositivo di Casso una selezione dei progetti finalisti, che rimarrà visibile al pubblico nelle giornate del 3, 9, 10 e 17 maggio, con orari 10.00-12.30 e 14.30-19.00.